World Thrift Day is observed on October 30 every year. The first International Thrift Congress was held in Milan, Italy in 1924. 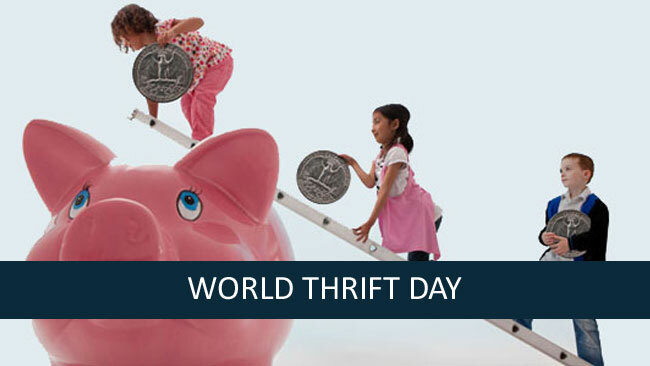 The congress passed a resolution declaring October 30 as the World Thrift day. It was a day “devoted to the promotion of savings all over the world”. It is a worldwide celebration well supported by savings and responsible retail banks, schools, women’s associations, sports bodies, cultural organizations and professional agencies etc. The day reminds us of importance of consistently saving in order to have a safety net. With such consistent savings, we can guard against unexpected risk events. Savings can also help us in achieving our goals such as starting a business, getting good education, healthcare treatments or owning a home etc. The first International Thrift Congress which was held in Milan, Italy in 1924 had declared October 30 as the World Thrift day. The aim of celebrating this day is to change our behavior towards the saving and constantly reminds us the importance of wealth. Wealth in terms of saving will act as a safe guard to face financial crisis. It helps us in starting a business, getting good education and availing good healthcare treatment. Habit of saving will give independence to both people as well as the country. Thrift is one of the ancient Indian virtues. Right from our childhood days, our parents teach us importance of wealth and the need for saving. A well known saying is “Cut your coat according to your height”.